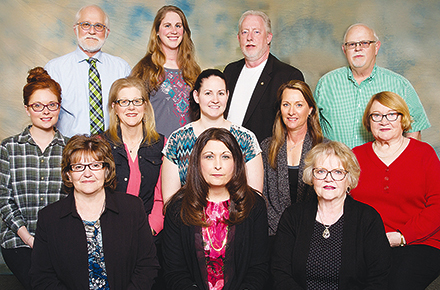 ADVISORY COUNCIL members are (front, l.-r.) Janice Kleveland, Kay Osborn and Kaye Koehler; (middle) Chelsey Steensnes, Judy Pribnow, Sandy Miller, Tracy Zentner and Connie Sugden, (back) Mark Palmer, Julie Krause, Dennis Morgan and Ron Delaney. Boone County Health Center has formed a Patient and Family Advisory Council (PFAC). This council will open communication between the Health Center and patients and families. PFAC will meet quarterly to discuss positive thoughts and constructive criticism about the care provided at the health center. The PFAC members were chosen from a list of applicants in the health center’s service area. Members represent various age groups. The members are Sandy Miller of Spalding, Julie Krause of Brunswick, Chelsey Steensnes of Fullerton, Judy Pribnow of Albion, Tracy Zentner of Cedar Rapids, Dennis Morgan of Elgin, Kay Osborn of Albion, Janice Kleveland of Newman Grove, Connie Sugden of Albion, Kaye Koehler of Newman Grove, Mark Palmer of St. Edward and Ron Delaney of Fullerton. Tracy Zentner was selected by the PFAC as the recorder. Connie Sugden was chosen by PFAC to be the spokesperson. She will report to a health center representative on the suggestions and insights shared during the PFAC meeting. The input from PFAC will help the health center plan and evaluate quality improvement projects. The health center will also use the PFAC’s input to help establish patient and family-centered care priorities. The formation of PFAC is one part of the health center’s efforts to become a certified Patient Centered Medical Home (PCMH). PCMH places the highest interest on quality care while keeping the patient and their family in the center of their health care.